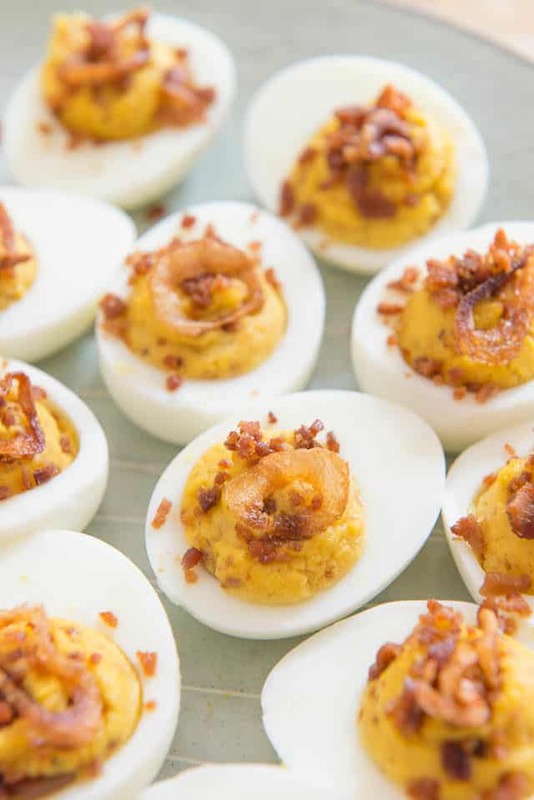 These Bacon & Crispy Shallot Deviled Eggs are such a delicious appetizer! They have just the right amount of creaminess, plus crispy shallots and bacon for flavor and texture. For years I thought I didn’t like deviled eggs. 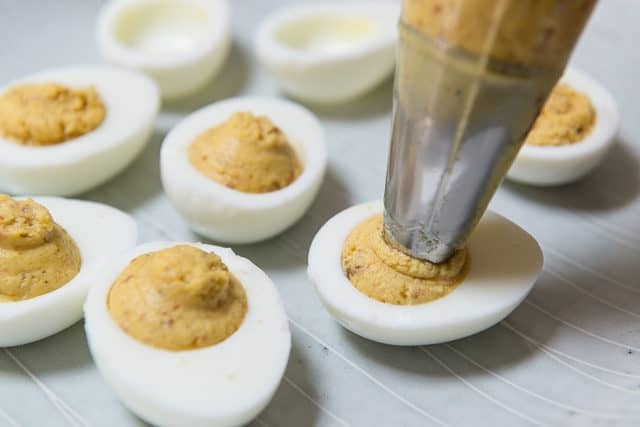 I’d had far too many deviled eggs at parties that had gag-inducing amounts of mayonnaise and way too much ground paprika dumped on top. Have you had those too? 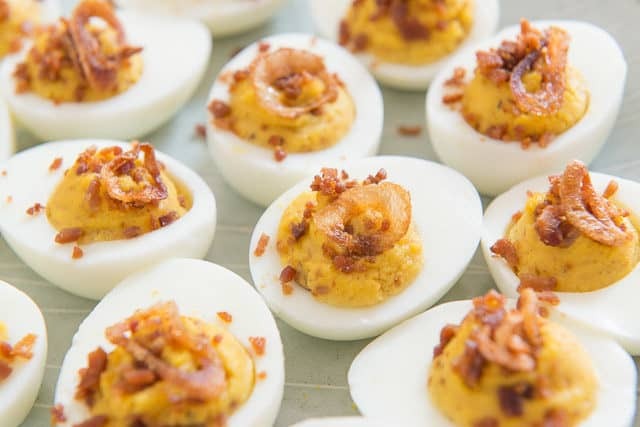 Deviled eggs don’t have to be that way. 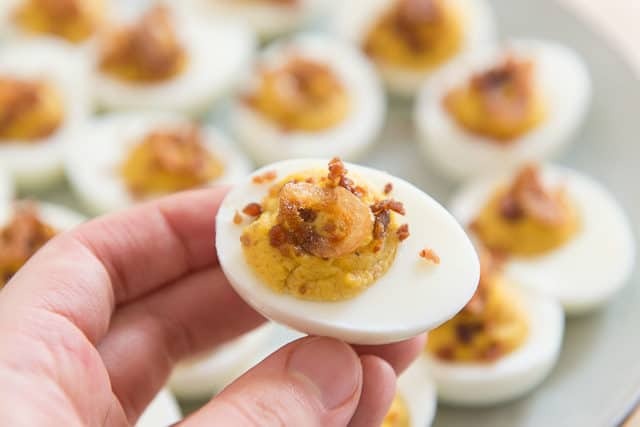 I think the best deviled eggs are creamy and balanced, with a few star flavors added to make it more interesting than just hardboiled eggs with mayonnaise. Case in point: I love these Smoked Salmon Deviled Eggs, which are classic with just a bit of smoked salmon, and these Chile Oil Scallion Deviled Eggs, which have a subtle Asian flavor theme. In today’s case, crispy bacon and crispy shallots are the stars of the show. They add both flavor and texture. Pete and I couldn’t stop eating these. 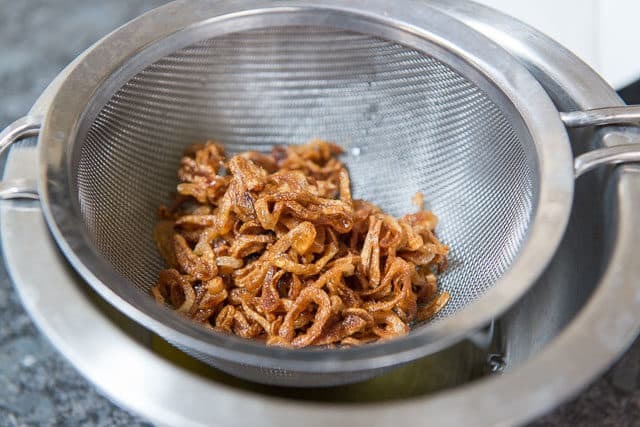 To get started, make the crispy shallots. It’s incredibly easy! Make sure to reserve the shallot olive oil. We’ll use a little bit of it in the filling, and the rest is great for cooking with vegetables. I never throw it out! Next, it’s time to separate the eggs. Here’s a post on How to Cook Bacon in the Oven, which is my preferred method! I like to blend this mixture up in the food processor to get it smooth, but you can also stir by hand if you don’t mind it a little chunkier. If you don’t want to pipe it, you can also use a cookie scoop or a spoon. And it’s ready to enjoy! Can deviled eggs be made ahead? You can prep the hardboiled eggs the night before, as well as make the filling. I wouldn’t recommend assembling them more than a few hours in advance, so the shallots don’t get soggy. Can you freeze deviled eggs? I don’t recommend it. Can you refrigerate deviled eggs? 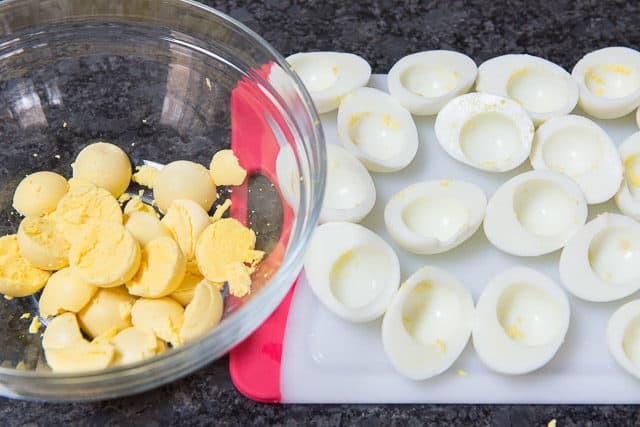 I wouldn’t refrigerate them already assembled, but you can refrigerate the hardboiled eggs and filling ahead of time, then assemble everything before serving. How to transport deviled eggs: These are tougher than other foods to transport, but you can try these containers. 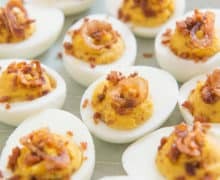 Are these deviled eggs healthy? This recipe is Whole30-compliant, paleo, gluten-free, low carb, and dairy-free. I think they’re healthy! Place the sliced shallots in a small saucepan and pour the olive oil on top. The oil should cover the shallots (or come pretty close). If needed, add more oil to cover. 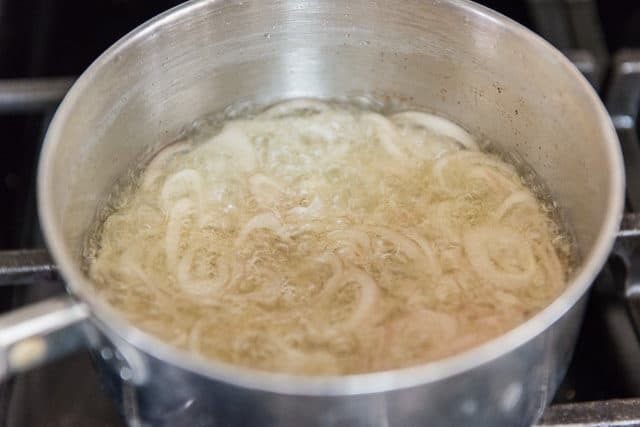 Cook the shallots over medium heat for about 10 minutes, until the shallots are golden brown. Make sure to watch them closely at the end, since they can go from crispy to burned quite quickly. 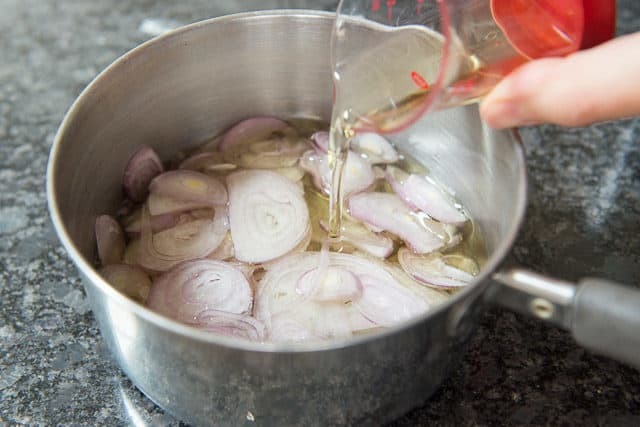 Pour the crispy shallots and oil through a strainer set inside a bowl, reserving both the shallots and oil. 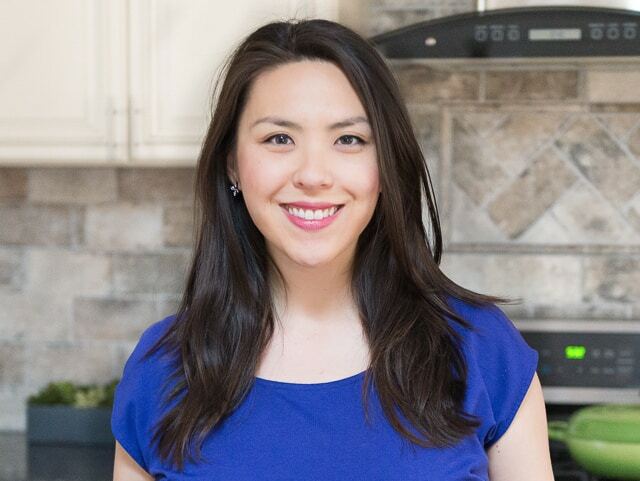 Cut the hardboiled eggs in half and remove the yolks to a food processor bowl. Set the remaining egg whites on a cutting board. 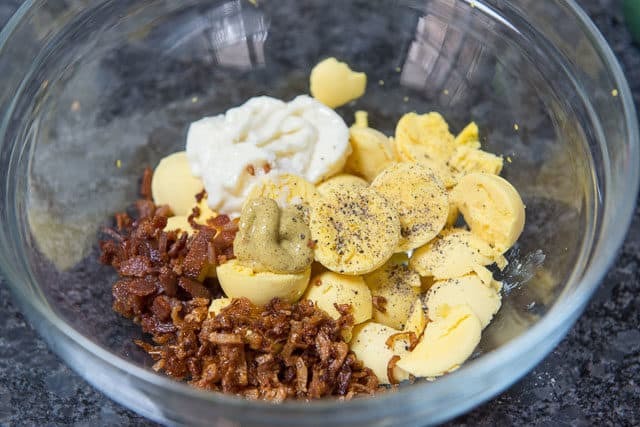 To the food processor bowl, add 1/4 cup of the crispy shallots, 2 tbsp of the shallot oil, 2 tbsp of crumbled bacon, mayonnaise, mustard, salt, and pepper. Process for about 30 seconds, until smooth. Transfer the mixture to a piping bag, and fill the hardboiled egg whites. Garnish each egg with the remaining crumbled bacon and crispy shallots. Enjoy! *Use a regular olive oil, not extra virgin. **Here's a post on How to Cook Bacon in the Oven, which is my preferred method! Note on the calories per egg: the calculations here are done automatically and include the entire 3/4 cup of olive oil, which isn't used entirely for the recipe. It's probably closer to 100 calories per egg.